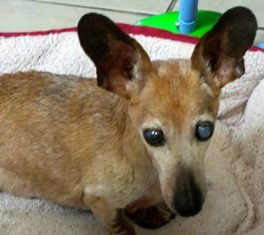 Forever Foster, Mandi Jo, rescued by Dachshund Rescue of Houston in August 2008, went to Rainbow Bridge on November 23, 2013. 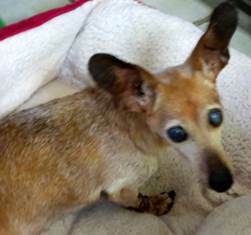 We extend our deepest sympathy to her foster family who cared for her and gave her lots of love during her golden years. 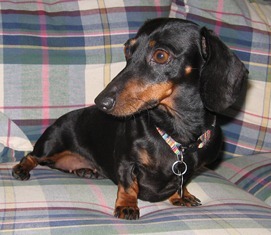 Bella, adopted from Dachshund Rescue of Houston on March 4th, 2013, lost her battle with disc disease on November 15, 2013. Our hearts go out to Pam and her family for the loss of their precious little girl. The second I held Maizy, I was done. It was love at first sight. After a failed adoption of another dog that had me really down, she made me happier than I can describe. It's amazing how much you can fall in love with a two-pound furball in 72 hours, but by day three Maizy had stolen our hearts and become family. 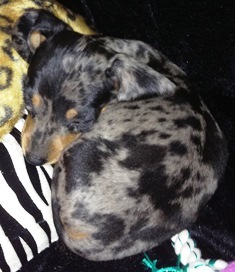 It was also on day three that our sweet girl was diagnosed with Parvo, so we hospitalized her immediately. She had 24-hour care, plenty of antibiotics, fluids and even a blood transfusion. She actually did show some progress the day following the blood transfusion, but it was short-lived. My little girl was such a fighter, but her tiny body just wasn't as strong as her mind. I went to the hospital to see her one last time before she passed. She kept giving me the sweetest puppy kisses and putting her tiny snout up to my face like she couldn't get close enough to me. I was afraid she wouldn't remember me when I went to see her since at that point she had spent more days in the hospital than she had at home, but she did. She knew exactly who I was and I made sure she knew how much I loved her. 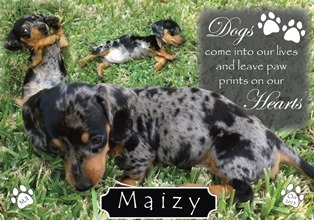 And then one week to the day after we brought her home, sweet Maizy passed away. 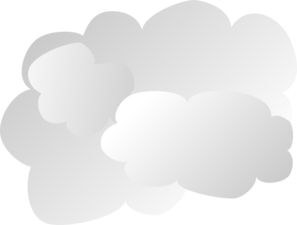 I am very sad, but somewhere inside me, I also have found comfortthat I at least gave her a fighting chance. Without our family, her infection likely would have gone unnoticed and untreated, and she would have had a very unceremonious passing devoid of any love. 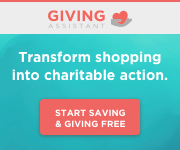 If the failed adoption would have gone through, I never would have had that opportunity. 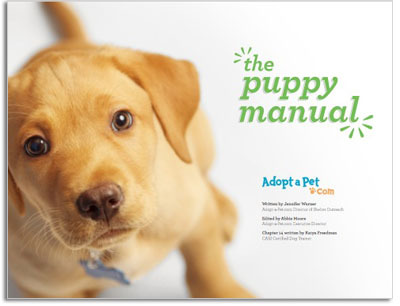 I know now, though, that I wasn't meant to adopt that dog. I was meant to love Maizy. She was only with us for a short week, but in that time span she received more love than some dogs do in their entire lives. And in turn, she touched my heart and my family's life in a way I never thought possible in a week's time. I may not have been able to save her life, but our family gave her a beautiful ending that I will always remember and cherish. Thanks for the joy you brought to our lives, sweet Maizy. We love you and always will. 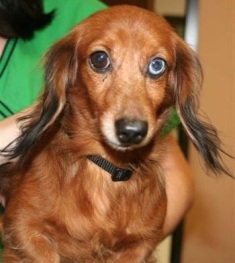 On February 14, 2007, several Dachshund Rescue of Houston fosters received a message that two senior longhaired dachshunds were in need of a foster home. 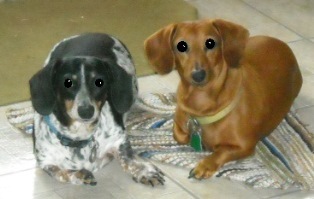 I asked my husband, Dave, if we could foster them and he said "No". Undeterred, I immediately left for Westside vet clinic and picked up these two girls. They were in our home for a couple of hours and I knew they had to stay. 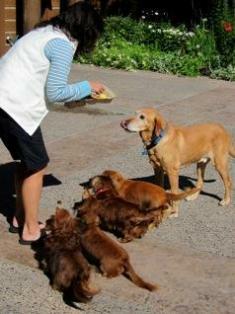 It took two weeks to convince Dave, and they were officially adopted on February 27, 2007. They were friendly, housebroken and so sweet. My veterinarian estimated they were born in 1998, making them 9 when adopted, and Dolly 15 when she passed. Sable is hanging in there, still has a great appetite and gets super excited at meal time. 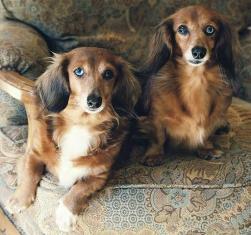 Sable and Dolly were a bonded senior pair adopted from Dachshund Rescue of Houston by our wonderful friends, Cindy and Dave, in 2007. Cindy and Dave weren't concerned about the dogs' senior status, and Dolly and Sable turned out to be wonderful and loving pets. 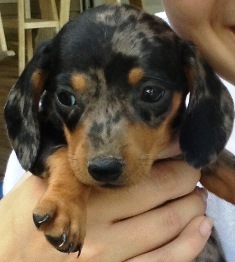 Unfortunately sweet Dolly was taken from them way too soon. 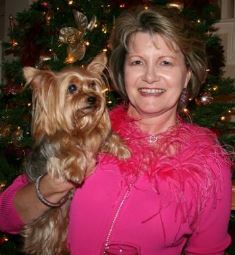 Our hearts go out to Cindy and Dave for the loss of their precious Dolly. Arnold came to our door one Sunday afternoon in 2001. He was roaming the neighborhood looking for scraps. At first I just shooed him away, but then I felt sorry for him and let him in the house. He promptly peed on our wall so I kicked him back out. A few minutes later I saw him dodging traffic. I knew his number would be up if he didn't get out of the street so I let him back inside, but I told him if he peed again it was over, he'd be back out the door. He never peed in the house again. We took Arnold to our Vet to be checked for a chip. He had none. 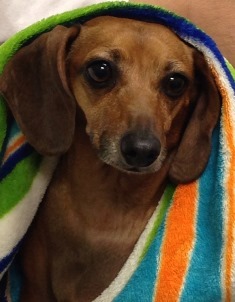 While we were there a lady gave us the name of a rescue group in Houston that specialized in Dachshunds. The contact there was Shelly. The rest is rescue history. We kept Arnold as well as many others that followed him. We still have eleven. 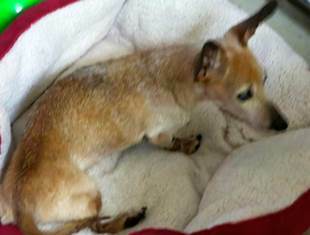 Arnold has been suffering from heart failure for some time now and this morning he had his ticket over the rainbow bridge bought and paid for. We took him to our vet and sent him on his way. He was good little boy and will be missed. We gave him a home and he gave us his love. I think that was a pretty fair trade. 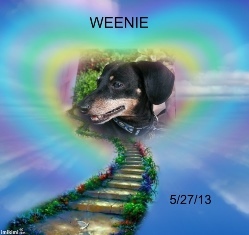 With heavy hearts, we extend our sympathy to Sarah for the unexpected loss of her sweet boy, Weenie, who crossed Rainbow Bridge on Monday, May 27, 2013. 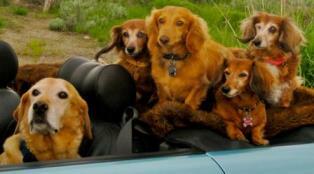 Weenie was on a play date Sunday when he stumbled upon a hive of bees. After a night at the ER, he was unable to recover from all the stings. 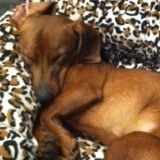 Recently, Weenie had struggled with chronic pancreatitis. We think maybe God decided it was time to end his suffering. To the very end, her world was one big tail wag. She traveled, ate her meals and even drank water wagging her tail. She was a dear companion who left us too soon. Our world has lost a tiny piece of happy. 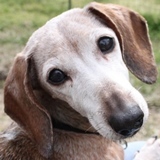 The fosters and volunteers of DREAM extend our deepest sympathy to Kathleen and Dan for the loss of their sweet Miss Shannon, adopted from Dachshund Rescue of Houston. 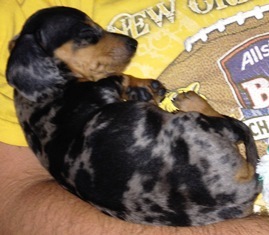 From Blu's Dad (5/23/13): For any of you ol' DRoH folks you may remember Blu. When I picked him up at BARC he weighed 28lbs so I named him, "Howard Huge". We later learned his real name was Blu. He also dropped to 15lbs with the help of his mom and a strict diet. 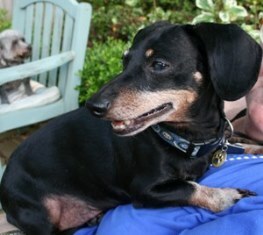 Blu was a good boy and a faithful companion to Simon, one of our other Dachshunds. They were the only two dogs we had that shared a crate. Simon will miss him terribly. 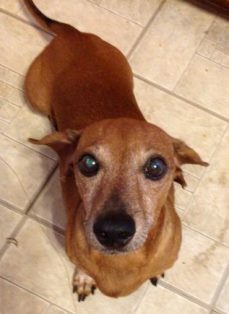 A few weeks ago Blu was diagnosed with congestive heart failure which is fairly common in dogs who have undergone heart worm treatment earlier in their lives. This morning he wouldn't eat and was walking very slowly. 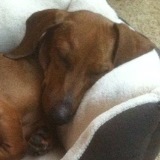 An hour later he was down and laboring to breathe. We rushed him to the vet to have his passing eased. We buried Blu, in a little patch we call the Pet Cemetery, with his friends who have gone before him. Run free Blu... We love you! Our heartfelt sympathy goes out to Pat, Rick, and Reagan for the loss of their precious Kacee Michelle. 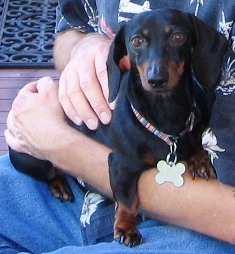 Kacee Michelle crossed Rainbow Bridge on April 12, 2013 after giving Pat and Rick 15 years of happiness.